A fledgling fan of the Clarets has got his tiny hands on his fourth Turf Moor season ticket – and he’s only just turned three-years-old. Quite probably the youngest fan of Burnley Football Club, little Henry Walsh, who turned the big 3 on January 24th, has seen his season ticket renewed thanks to dad Ben (37). There was always only going to be one club for Henry, from the moment his parents Ben and Ashley became the first couple to get married on Turf Moor, in 2009. Former Gawthorpe High School pupil Ben, who now lives in St Helens with Ashley and their other two children Madelynne and Elise, said he hopes Henry will have a lifelong love affair with the Clarets. Clarets legend Jimmy McIlroy was a surprise guest at the couple’s wedding, and Henry’s season ticket is now in the stand which bears the Northern Ireland great’s name. 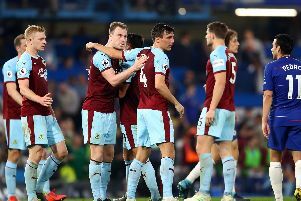 A spokesman for Burnley Football Club said: “The level of support at Turf Moor never surprises us. Henry's extra special in that he's been a loyal Burnley fan literally since birth. "Hopefully he can be one for many seasons to come and enjoy the highs with us."